We have officially ordered our new kitchen cabinets. This is new territory for us since in our last kitchen remodel we chose/were able to reuse a lot of the cabinets and filled in the rest with off the shelf cabinets from Lowe's. This time around, we aren't really able to reuse the cabinets since we can't move them without doing damage to them and one of our major issues is that the upper cabinets are way too close to the base cabinets. So this time we decided to get completely new cabinets. We initially looked at Lowe's to set a base for the pricing. 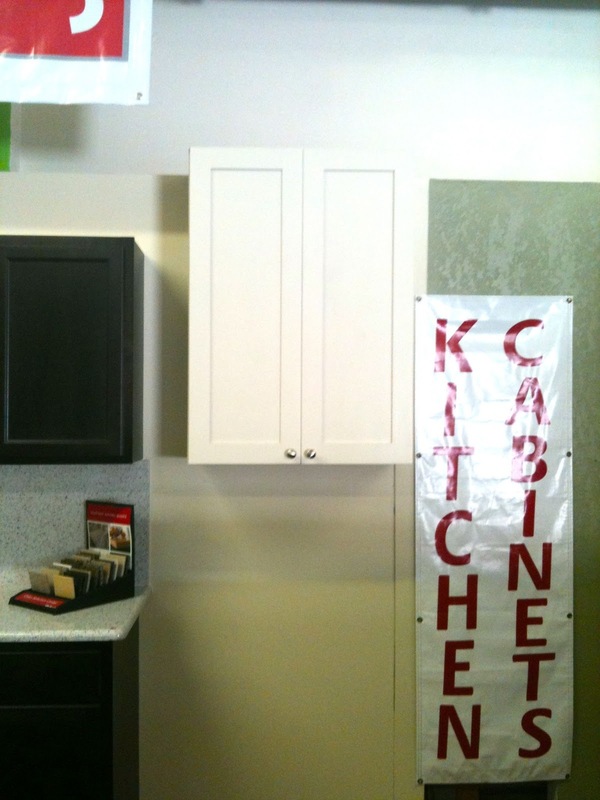 We weren't thrilled with the price for quality so we then checked out a local cabinet company, Cabinets for Less. They were really great with us and spent a couple of hours working through different layouts and possibilities to maximize space and function. They also only sell all wood cabinets and the ones we were looking at come with soft close doors and drawers as part of the price (not an upgrade). Here is a pic I snapped with my phone of a door sample. Delivery is also covered (which is huge!) but you have to install them yourself (which you have to do with Lowe's as well unless you want to pay for them to install). With all that, I was fully expecting the quote on these cabinets to be a lot more than Lowe's but they ended up being about half the price of what Lowe's quoted us. Between this and the fact that we like to buy from local companies definitely made us lean towards Cabinets for Less but didn't buy the cabinets the first time we went in. 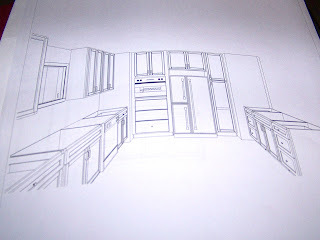 We spent about 5 months considering the layout we decided on and slowly tweaking our kitchen to get closer to that ideal. 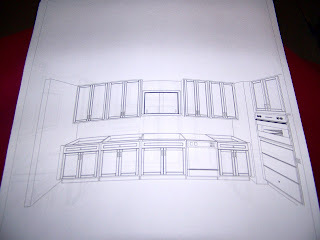 Finally, a couple of weeks ago we went back in and with a few tweaks to our design, finally placed the order for the cabinets. They should be delivered at the end of this week and will hopefully have them all installed next week. This is a full upper cabinet in the off-white. 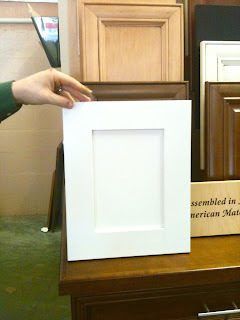 We went with a classic shaker style cabinet door and I cannot wait to have wood cabinets. We have only had the thermo-foil cabinets and I absolutely hate how they peel and warp. Plus with these, if we ever wanted to paint them we could...unlike the ones we have that can't be fixed once they start peeling. And as far as the layout, here are some pics of the design pages. We are keeping the sink under the window and we will be moving the door to the back entrance over so that the entire wall will be cabinets (instead of having awkward angled cabinets). As you walk into the kitchen from the back entrance you'll see our appliance wall that will have our wall oven, fridge and a tall pantry cabinet. And finally we have our peninsula. 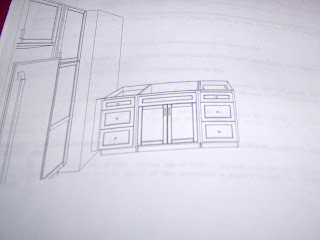 It will have our cooktop in it with hood. 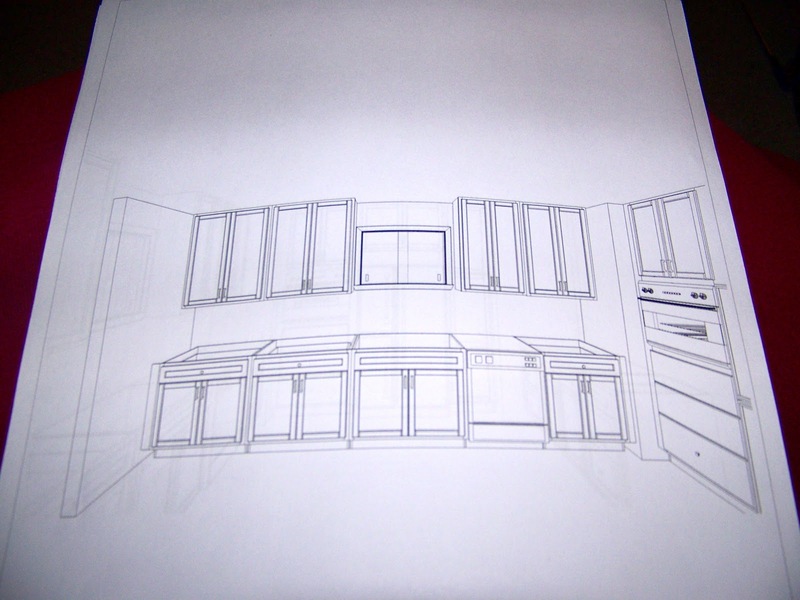 We are super excited to get to this stage in the kitchen that we can even be talking about installing cabinets! We still have a way to go, but we can see the light at the end of the tunnel!